This beachfront boutique resort is great for a family with young children who wants to be a few steps from the beach with full resort amenities. You can go snorkeling right off the coast, walk down the beach to collect shells, or drive to several restaurants and shops along Seven Mile Beach. The suite is fully air-conditioned and chicly decorated, with an open floor plan and ocean views. Sea Breeze has an open floor plan, beautiful decor, and modern amenities. 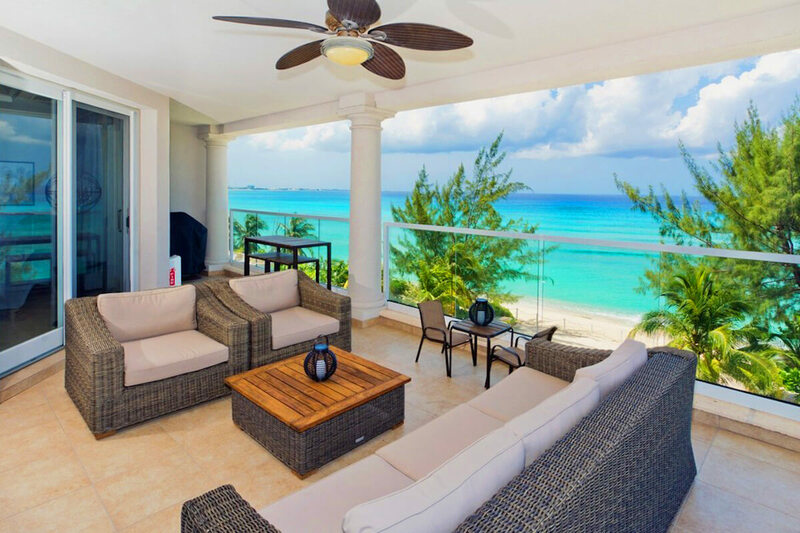 On the northern end of Seven Mile Beach, this beachfront boutique resort is perfect for a family vacation. Workout in the resort gym with cardio equipment and weights, or swim in the pool facing the sea. The beach and ocean are just a few steps away, so guests can snorkel, swim, or sunbathe whenever they wish to. Snooze in a hammock strung up between two palms, or recline on the suite’s private balcony. The fully-equipped kitchen has updated appliances, a breakfast bar, and easy access to the elegant dining area. The living room has classic, rustic decor set around an oversized sectional and flat screen TV. Guests can relax in the chic media room to watch movies, or close the curtains and read in peace. Each bedroom and bathroom is elegantly decorated, and has an ensuite bathroom and ceiling fan. The master bedroom has a king-sized bed, TV, and access to the balcony. The other two bedrooms each have queen-sized beds and TVs, and the fourth bedroom has two twin beds. The sofa in the media room also converts to a queen-sized futon. This suite would be ideal for a family with young children. It’s in a well-developed area within a 5-minute drive of dining and shopping, and a few steps from world-class snorkeling. Located on Cemetery Beach, one of the best snorkeling/diving spots on the island. Seven Mile Beach is a just a short walk from the villa. Sea Breeze 8 is beautiful. It has a great mix of open living space, a beautiful master suite, and three nice bedrooms. It also has a nice media room that we didn’t use, but it could be a real plus if you’re traveling with older children who need a getaway. Everything was in A+ shape and the kitchen had everything we could need. We really enjoyed the outdoor living area on the balcony. The beach was beautiful, is raked regularly, has good snorkeling with a bit of a swim, and was very quiet. The pool is excellent. The location worked well for us. Although the villa is away from the center of the action, it was convenient to the grocery and liquor store, good restaurants, and West Bay. The inside parking with the elevator was very convenient. Our only issue was the hot water. The water would be hot for a minute, then turn tepid. Anne, the manager, said it was reset, but it still didn’t work right. We never could get enough for the tub, and showers were hit or miss. That system needs to be figured out and fixed. The cleaning team did a nice job and they were very nice. They should check the dust under the furniture and the bottom shelf of the long “side table” in the dining room. WhereToStay was easy to book through and Sharon was outstanding. She was a real host who wanted to be sure we had a great time. She offered great ideas, recommendations, and answered every question. The trip would not have been nearly as easy or enjoyable without her help. I would absolutely recommend her to anyone.